hat are the two biggest challenges for artists working in this digital age? I wrote Fans, Friends & Followers to address those challenges with useful strategies, examples, explanations, and first-person success stories. 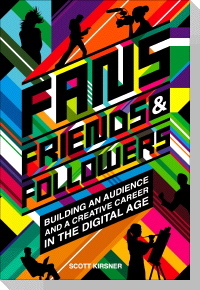 It includes an overview of the tools, sites, and services that pioneering artists are using to create a new relationship with their audience. The heart of the book is a collection of thirty interviews with visual artists, comedians, animators, documentary filmmakers, musicians, writers, and others who’ve pioneered new ways to build a creative career online (and off.) It delves into the business models that can support leaving the day job behind. And all of the material in the book was collected in 2008 and 2009. You can peruse the Table of Contents, check out some bonus material, purchase the book in digital or paperback form, or get a totally free, full-color PDF download.